We flew to Mexico on a direct flight to Puerto Vallarta with AirTransat. Their flights were so much better then SunWings. They do 8 days instead of 7 which is nice. We booked the flight and resort separately through expedia. So what this meant was that we didn't get the shuttle that takes you from the airport to the resort and vice versa. But to get that service it was an extra $300 or something like that. The airport provides a taxi service with 3 companies at a set rate that you pay before you even get in the taxi at a booth in the airport. You don't tip these taxi drivers. It was 450 pesos from the airport to our resort which is about $48 canadian. On the way back to the airport, you use a different taxi company and they hang outside the resorts and it costs 100 pesos. You can find the cheaper taxi option leaving the airport if you want to carry your luggage to outside of the airport which is a lengthy walk so we didn't do it. We were about an hour delayed leaving Calgary because they had to de-ice the plane. All the planes had to be de-iced and so the de-icer was behind schedule because it had so many planes to do. 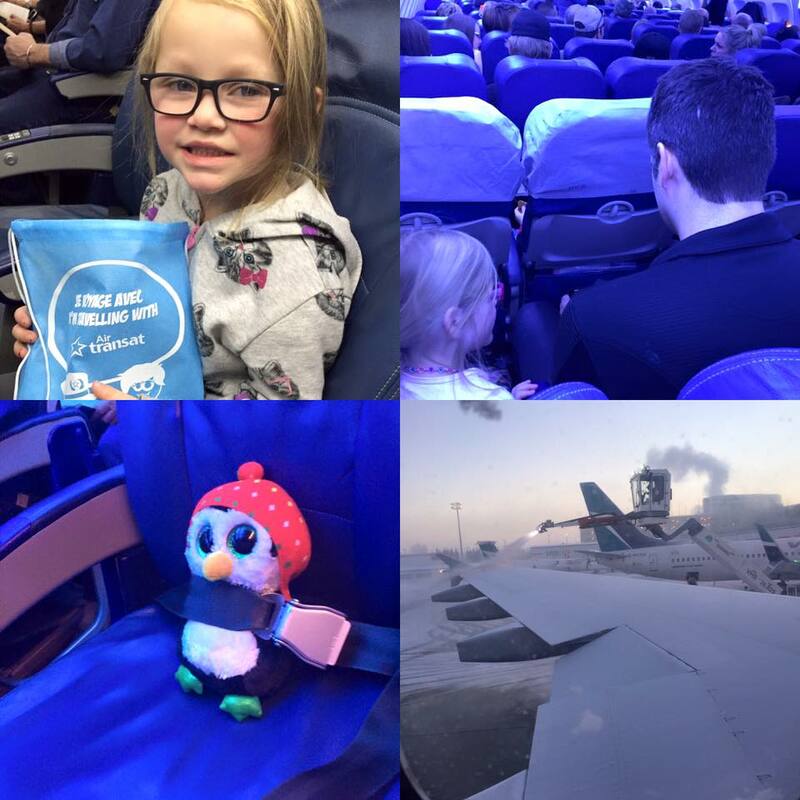 AirTransat has a kids club and they leave goodie bags for all of the kids on their seats. It had an inflatable beach ball, coloring books, stickers, headphones and markers. 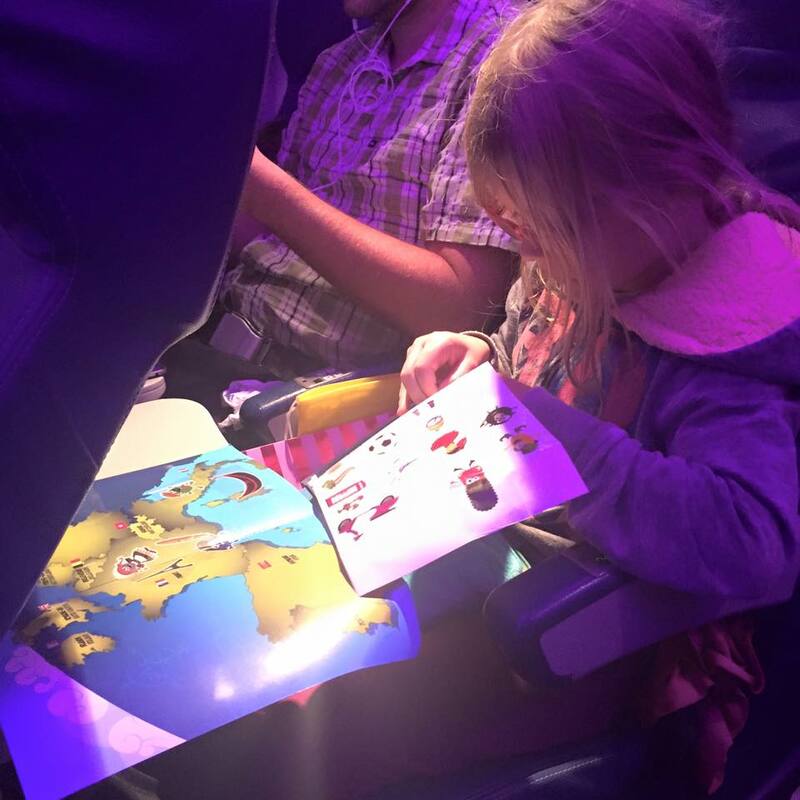 It was nice to have extra stuff for the kids to play with on the plane. AirTransat offers a streaming service for movies on your iPads + mobile phones. They also have an app but they said before we boarded that you didn't need the app for your tablet so I didn't download. More on this later. Their movie selection wasn't that great and was mostly christmas movies and random tv shows. They showed The Intern with Anne Hathaway and Robert DeNiro on the bigger tv's and so I watched that. It was alright, pretty cheesy with a lot of filler in my opinion. But it was a good way to pass the time. 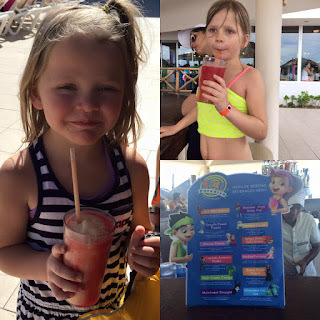 We arrived to our resort and even though our room wasn't ready yet, they gave us wrist bands and we went and had a late lunch and played by the ocean and explored the resort. It looks old from the outside and lobby so I was a little worried but all those worries washed away when I explored it. It was more perfect then I could have imagined. The resort has fancy drinks for the kids which was quite fun. Finley only tried the Monster High Soda Pop and the Frozen Freeze. She drank mostly the soda pop. They each got a fancy drink once per day and occasionally 2x per day. Penelope was far more adventurous and tried several more then Finley but she too mostly switched between the soda pop and frozen freeze. When I saw the drink list I decided I was going to have at least one before repeating any of the drinks. However, after looking at the ingredients in a bunch I knew I wouldn't like them so I didn't want to waste so I basically stuck to the Miami Vice which is the drink on the right. 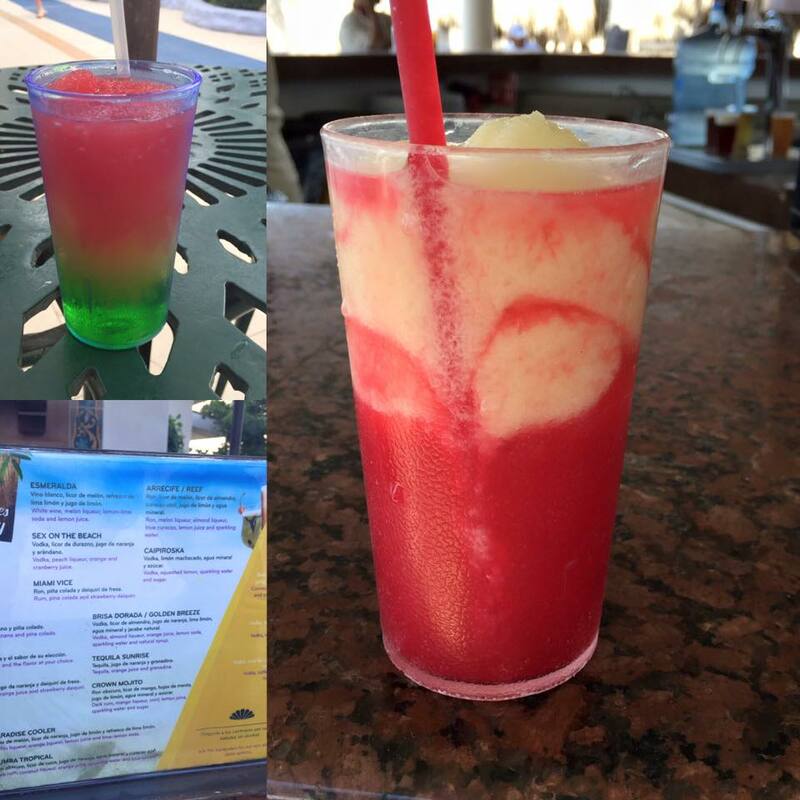 The drink on the left is a Riviera Maya which was Greg's favourite. They are so sweet. As the days went on, I went from having 4 or 5 a day to barely finishing one. My stomach ached from the amount of sugar I was consuming since it was far greater then normal. Thankfully being home, I don't seem to be craving the sugar that I was having there. The first morning there, I woke up at 615 to go run but it was still pretty dark out so I waited until it got light out, around 7:30 or so. I don't like running on sand because it bothers my knee when I run on uneven surfaces. 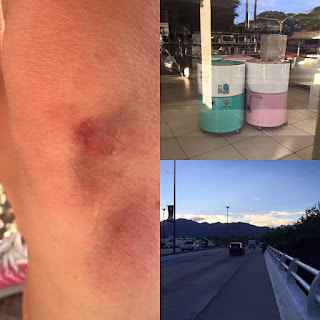 So I ran a long the main road which really sucked. I ran past mostly resorts and businesses. I also didn't run with headphones which I hate just to be a bit safer. I did past some sort of store that sold the coolest washing machines. They also had them in hot pink. Who wouldn't want such a cute washing machine in their house? 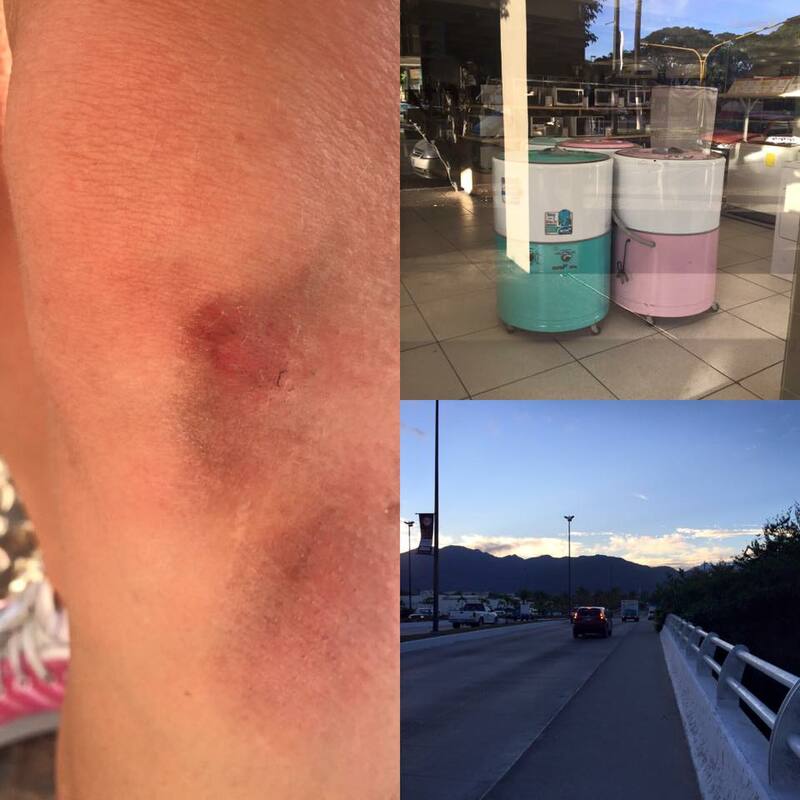 On my way back to my resort, I tripped over a speed bump that they have on their sidewalks. I scraped my leg up pretty good and it was a tough 2km run back. I didn't run again after this for a number of reasons: the view sucked, this knee hurt and my already bad knee was aching from all the walking on the sand we were doing each morning. I was disappointed that I only got one run in but I got over 15000 steps in each day so I was still really active. And I did get some core workouts in too. The flight home was a disaster as I mentioned yesterday. AirTransat again left goodie bags for the kids to play with and Finley very much enjoyed it. Penelope slept the whole way home. The movie playing for everybody was Interstellar or something like that which I had no interest in watching. I opened up the online streaming service and I was only able to watch 1 movie and no tv shows because it had to be viewed in the app which they said I wouldn't need with my iPad so that was disappointing. The one movie I was able to view was Southpaw with Jake Gyllenhaul and I thought it was going to be boring but it turned out to be pretty good. And he is pretty hot even as beat up boxer. I started thinking if I had ever watched a movie with him in it and so when we landed back in Calgary I looked him up on IMDB and the only movie I had seen with him was City Slickers and he was just a kid back them as was I so I have no recollection of him in it. He was in Everest that I do want to see. Anyways, it was a good movie and watch it if you get the chance. Time To Update Our Shelves!! !